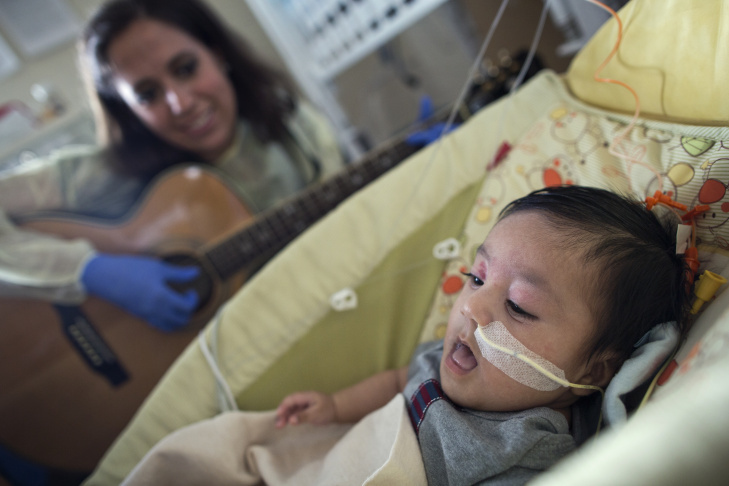 Araceli Viveros' 3-month-old son listens as music therapist Tacy Pillow plays a lullaby on Friday, Feb. 20, 2015 in the Newborn and Infant Critical Care Unit at Children's Hospital Los Angeles. The hospital uses music to help calm babies in the unit. 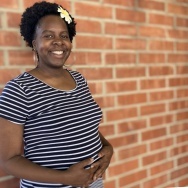 Tacy Pillow is a music therapist at Children's Hospital Los Angeles. 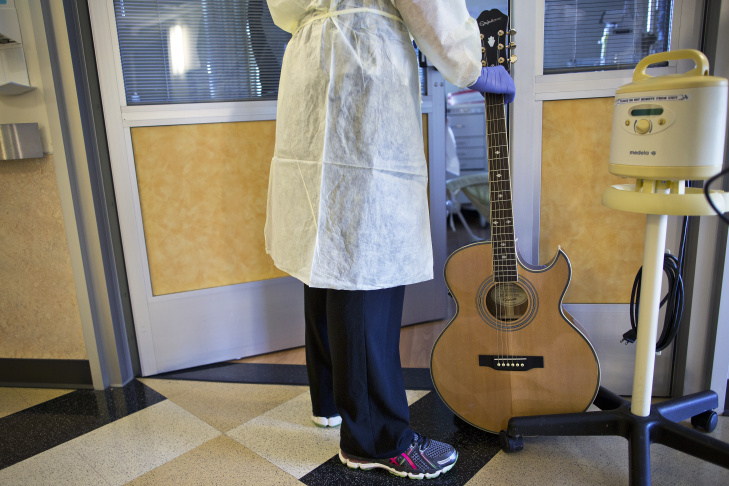 In addition to in-patient visits, Pillow has played guitar during routine procedures and surgeries. Scarlett Redmond is an actress with the Zimmer Children's Museum. 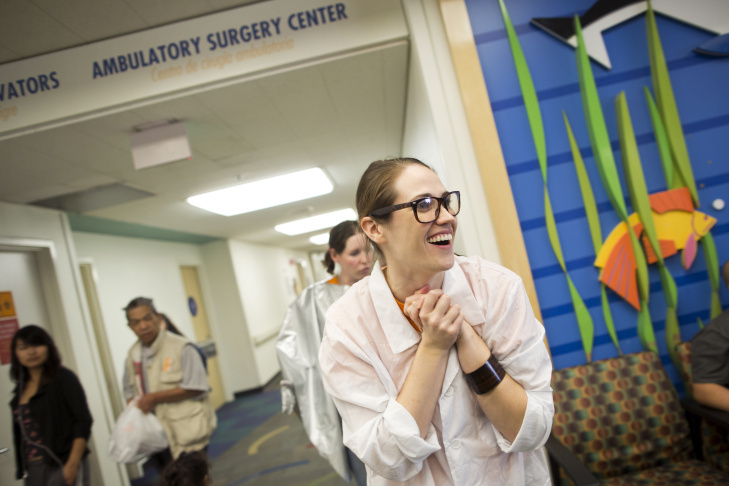 Redmond and her partner, Katie Curley, perform a skit on Monday, Feb. 23, 2015, in the AltaMed outpatient waiting room at Children's Hospital Los Angeles. The partnership with Zimmer Children's Museum helps expand the hospital's arts offerings. 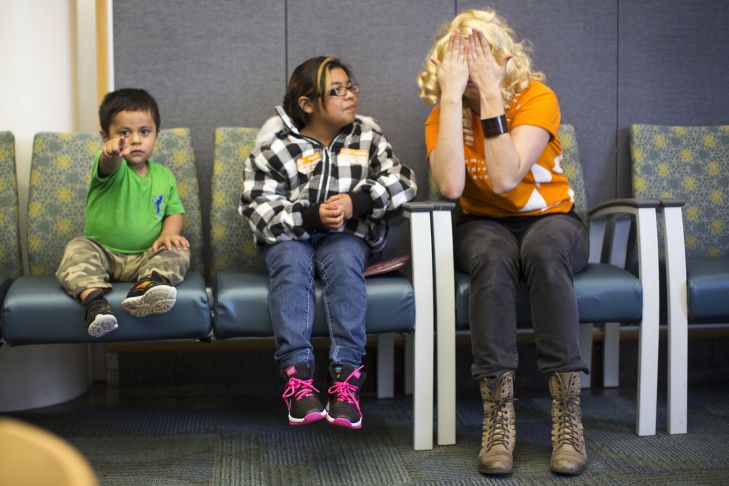 Actress Scarlett Redmond works with Jake Gonzalez, 2, left, and Julissa Tagle, 10, while performing a skit in the urology waiting room at Children's Hospital Los Angeles on Monday, Feb. 23. Music therapist Tacy Pillow begins a visit in the Newborn and Infant Critical Care Unit on Friday, Feb. 20, 2015. Music can help babies' heart rates decrease and calm agitated infants coming off of pain medications. 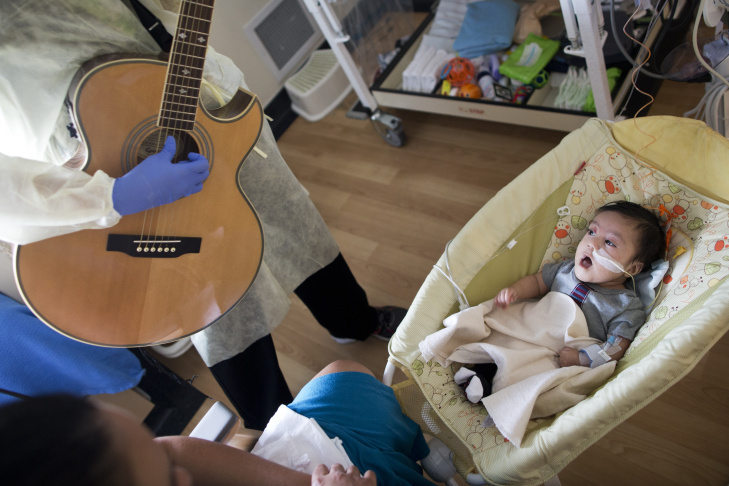 Tacy Pillow, a music therapist, plays a lullaby for Araceli Viveros' 3-month-old son in the Newborn and Infant Critical Care Unit on Feb. 20, 2015. 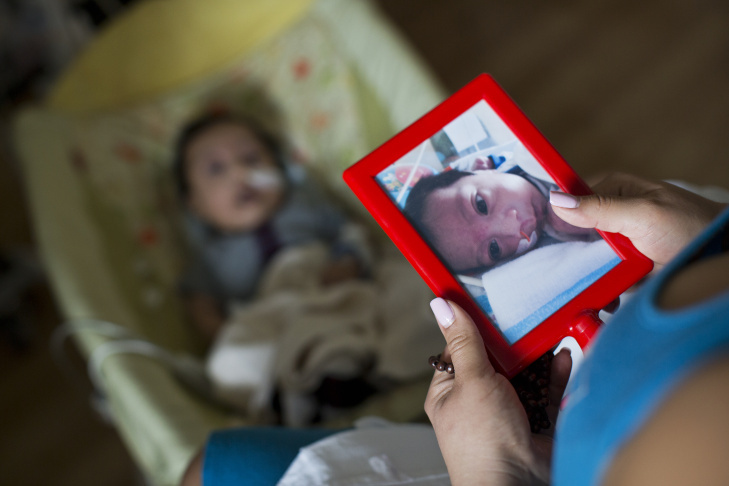 For the first two months after her son was born, Vivieros slept at the hospital every night. 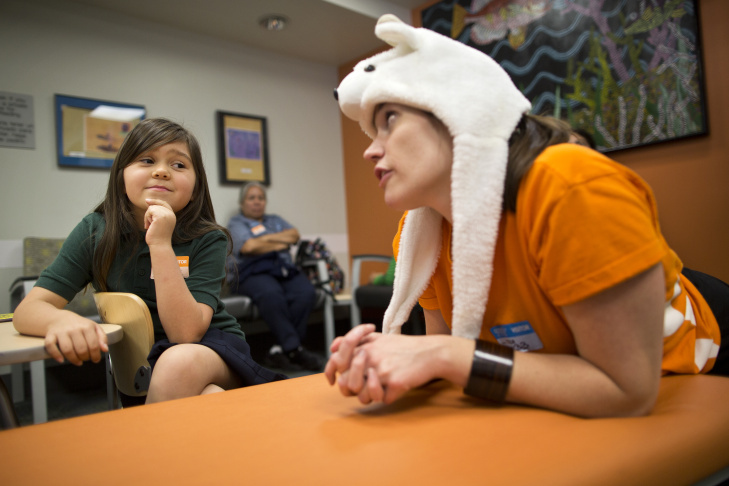 Six-year-old Eleyna Gomez takes part in a skit with actress Scarlett Redmond in the dentistry outpatient waiting room at Children's Hospital Los Angeles on Feb. 23, 2015. Once a month, two actors from Zimmer Children's Museum arrive at the hospital to act out skits. 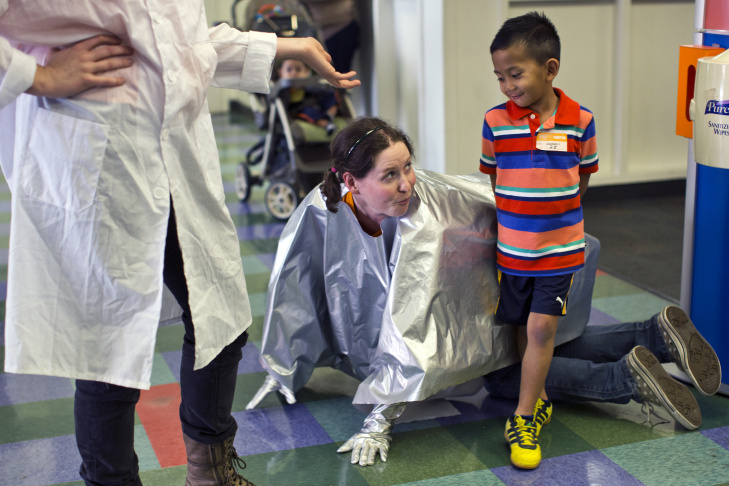 Actress Katie Curley plays a robot alongside 7-year-old Sebastian Galingan during a skit in the AltaMed outpatient waiting room at Children's Hospital Los Angeles on Feb. 23, 2015. Curley and her acting partner perform skits in outpatient waiting rooms, lobbies, the infusion center and inpatient rooms and playrooms. Araceli Viveros holds a photograph of her newborn son taken in December 2014. Her son had jaw problems when he was born and had to undergo surgery. 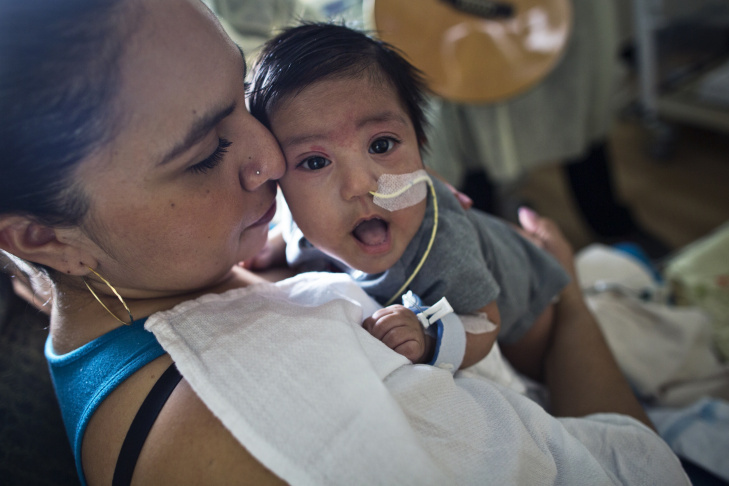 Araceli Viveros' 3-month-old son is now learning how to eat and coming off of pain medications. Music therapy has helped to calm him on days when he's agitated. There’s a change underway in some hospitals around the country where, increasingly, art is used as a tool for healing. "It's meeting the patient's need," Albers said. The hospital uses grant funds to employ eight workers who staff the hospital's Expressive Arts and Therapies Department. 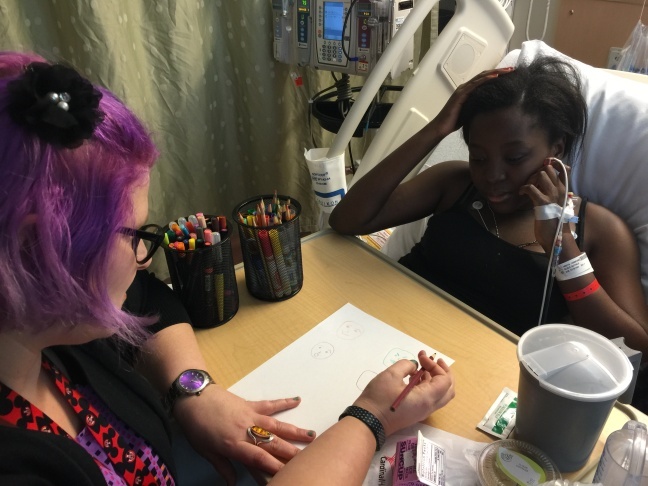 Doctors and nurses can order up art therapy for patients just as they might prescribe medications. The department offers clinical and non-clinical services to help patients manage pain and other challenges with their illnesses. On the clinical side, therapists help patients build coping skills to manage their pain and moods. On the non-clinical side, patients can attend art workshops, watch theater performances and more. 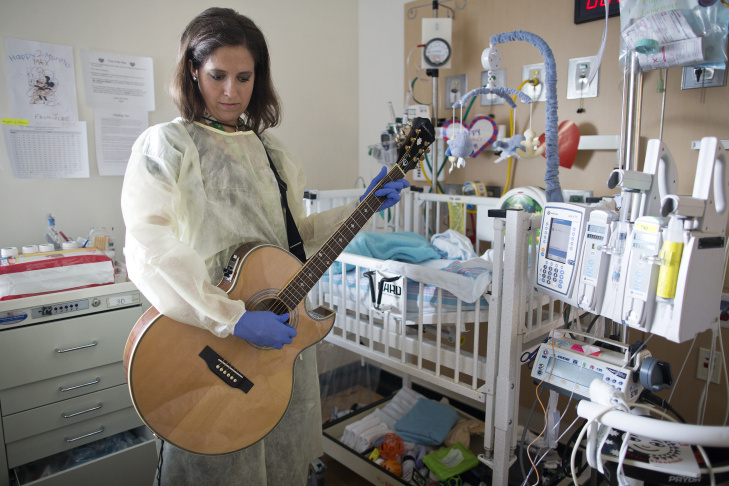 On one recent Friday in the hospital's Newborn and Infant Critical Care Unit, music therapist Tacy Pillow strummed a guitar and sang to a 3-month-old premie who recently underwent jaw surgery. The baby's mom Araceli Viveros watched the session. "It’s been really, really hard,” Viveros said. "It definitely makes me happy to know that he loves music and that it calms him and helps soothe him." Pillow said the music allows the babies to better deal with pain. "Music is always something that calms them. It can help calm them during routine procedures like a diaper change, or I’ve worked with higher medical staff even during, like, different surgeries," she said. Pillow has conducted research showing music creates positive physical changes in babies. In her study of 165 infants, 95 percent recorded lower heart rates after receiving music therapy, for example. Her findings track other studies on the positive effects of music and other arts for palliative care, even for patients who are dealing with life-threatening illnesses or facing death. Music therapy can also be a cost saver, according to Alexandra Field, manager of the arts and therapies department. Field said with music therapy, patients can leave the hospital up to 12 days earlier than other babies in the Newborn and Infant Critical Care Unit. Field said she wished the hospital had the budget to hire more dance, music and art therapists. If it did, she said they could use about 10 more therapists to meet the demand. “We haven’t been able to grow in the way that we need to," she said. Nathalie Bilolo, 21, is one of Children's Hospital's patients. She has sickle cell anemia, which sends pain seeping through her bones. She said it feels like getting hit with a baseball bat. Bilolo found painting and drawing have helped her cope. "It just gets my mind off of it. Like the more focused I am, the more like pain is fading away," she said. "I’m telling the pain that, like, I’m the one that controls the pain and the pain doesn’t control me." On the East Coast at Dana-Farber/Boston Children’s Cancer and Blood Disorders Center, there are similar programs. Nineteen-year-old Cassandra Crowley learned how to edit a video documentary while undergoing chemotherapy for lymphoma. She also learned painting and worked with clay during her treatment. "It was nice when people came in and taught me about things that I could use in the outside world and kind of give me like a reminder that eventually I would be in the outside world again," she said. Her 20-minute film captures her life as a teenager — a visit to the pizza parlor, scenes from cheerleading practice, and the grim realities like a tube known as a PICC line, that ran through Crowley's arm and into her chest. The college student is now in remission. 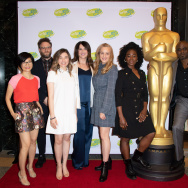 She decided to pursue a degree in film and now sees herself as an artist, something she said she would have never discovered without cancer and her treatment. "It gave me a lot of confidence when I didn’t feel like a lot," she said. American Art Therapy Association — This website offers a range of resources, including a 2015 guide with listings of professional art therapists. Children's Hospital — Read more about the arts offerings at Children's Hospital in Los Angeles and find contact information for hospital sources mentioned in this article. UCLArts and Healing — The website includes a list of literature and is a good source for research related to healing and the arts.